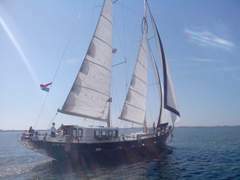 A unique, fantastic sailing seaship built for habitation and sailing around the world. This zeillogger/sail lugger is a newly built in 2007 replica of a 19th century sailing herring logger. 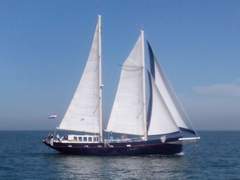 The ship is suitable for long (world) voyages, habitation and suitable as charter (day trips for groups and holiday trips). 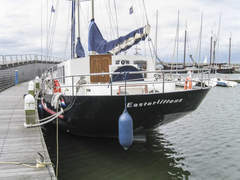 It is a modern built two-master, a very fast sailor (10 knots is no problem) and equipped with all comforts. Due to the thoughtful keel-midzerd construction, the ship has a large sailing area. 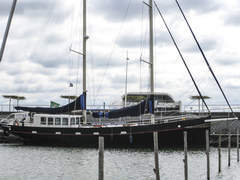 The client and current owner had a requirement to the designer to built a modern, safe, maintenance-friendly and easy-to-operate by 2 persons, comfortable ship, where he could live on. That has been done. The bow thruster, the anchor and the sails are hydraulically operated. The super generator provides all the required energy. Additional attention has been paid to safety. The sea rail is extra high, there are 3 waterproof doors in the ship and there is no gas on board. The ship is thoughtful and maintenance-friendly built with first class materials. There is no teak used, the ship is made of cortex steel and has 2 components of lacquer. It is very comfortable on board. There is plenty of seating on the front deck, the tip, the bow and the rear of the steering wheel and on the mirror. The deckhouse is light and spacious. There is a very extensive kitchen, navigation corner and a seating area for 12 people. The view around is amazing. Under deck there is a spacious lounge with desk, bar and seating area. The engine room is placed in the rear and there is a space for laundry machines. Midscheeps is a hallway with huts and shower and toilet on either side. 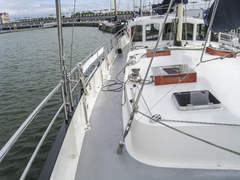 In the bow of the ship is a very spacious owner's cabin with private shower and toilet. 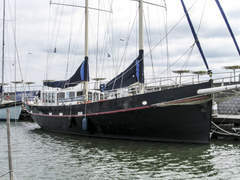 The ship is little used, from 1st owner and excellently maintained. An absolutely unique ship. A sailing comfortable apartment. 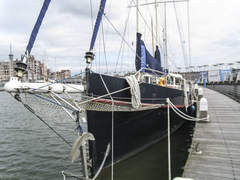 Sail lugger, name de Hoop, dimensions: 25 x 6 x 2-4 m, year of construction 2006-2007, building number 21.006, builder Helldörfer Shipbuilding Arnhem Holland, designer Peter Bosgraaf Yacht and Boat Design, S-spant, lift keel, cortex steal, water displacement 64 tonnes, 6 sleeping places in 3 cabins, 2 extra in the salon and 1 extra in separate room, standing height 2,20 m, bedlength 2,10 m, windows double glass in aluminum, 2 toilets and 2 showers, stainless steel sea rail, anchor winch (hydraulic), anchor 145 kg, 50 m anchor chain 16mm. 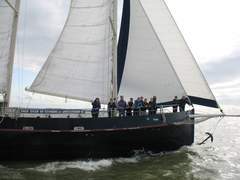 Schooner rigged, 23.5m height, standing rigg Duform 12, 14 and 19mm, main sails 76m2 and 78m2, forsail 36m2, kluiver 67m2, reeflines, 10 winches (Anderson), 4 hydraulic winches (2SP 50ST) . Engine: 2 x Perkins Sabre RE30850, 2 x 87 HP, construction numbers 290112N and 290116N, construction year 2006, only 500 houres, diesel, fuel 8 liter p/h, hydraulic transmission, steel diesel tanks 3,000 liter, tachometer, hour counter, oil pressure gauge, temperature gauge, folding propellor, Hydraulic bow thruster (10 hours). 5 x 12V battery, 12 x 2V batteries, shorepower, inverter (Victron), generator (Kohler 9 KVA), volt / amp meter, compass, depth gauge, fishfinder, windset (Maretron, multifunctional), GPS (Maretron), VHF 3500 E), radar (Nobeltel), AIS inland waters navigation. Steel water tanks 4.500 liters, boilers (180 liters), 2 showers, 2 toilets, rubbish tank 4.500 liter, refrigerator, freezer, four-burner induction cooker, oven microwave (electric), heating (hot air electric).